The Sportsman® cell is our most cost effective soft bladder fuel cell. The Sportsman® cell meets all FIA-FT3 requirements and is designed for use with all hydrocarbon fuels. The Sportsman® bladders are constructed with a proprietary pre-coated fabric that offers a great balance of performance and price. • Durable, FIA-FT3 certified Sportsman® bladder. 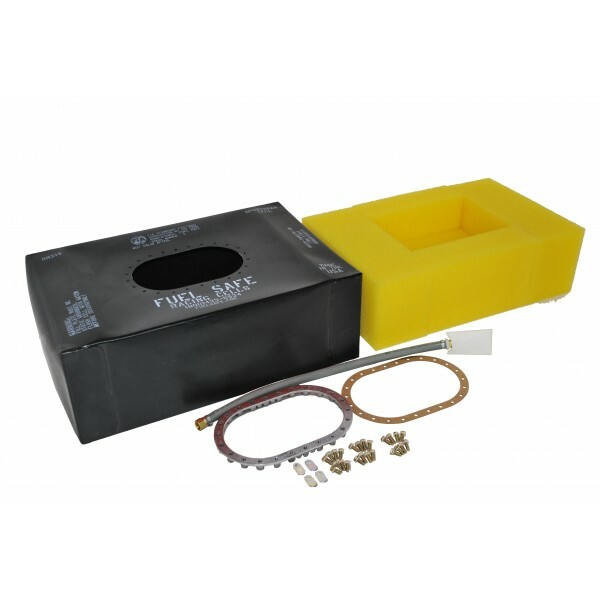 • Recommended upgrades: surge tank, sending unit, light weight aluminum can and more! See the parts section of our catalog for a complete listing of all available accessories. RB205 5 gal Fits SM105 13.625" x 13.625" x 8.375"
RB208A 8 gal Fits SM108A 20.75" x 16" x 7.75"
RB208B 8 gal Fits SM108B 20.125" x 12.125" x 8.625"
RB210 10 gal Fits SM110 25.625" x 10.125" x 10.125"
RB212 12 gal Fits SM112 20.75" x17.875" x 9.5"
RB215 15 gal Fits SM115 26" x 17.875" x 9.5"
RB215-06 15 gal Fits SM115-06 24.625" x 17.125" x 9.125"
RB217 17 gal Fits SM117 20.125" x 17.125" x 12.75"
RB218A 18 gal Fits SM118A 28" x 17.125" x 9.875"
RB218B 18 gal Fits SM118B or SM118C 33.5" x 20" x 6.5"
RB222A 22 gal Fits SM122A 34" x 18" x 9.5"
RB222A-FF 22 gal Fits Factory Five SM122A-AFF 34" x 17.5" x 9.5"
RB222B 22 gal Fits SM122B 25.5" x 17.125" x 13.75"
RB222C 22 gal Fits SM122C 25.75" x 25.75" x 8.5"
RB224 24 gal Fits SM124 25" x 16.75" x 13.625"
RB226 26 gal/100L Fits SM126 26.25" x 17.875" x 14.5"
RB229 29 gal Fits SM129 24.25" x 24.25" x 12.75"
RB232A 32 gal Fits SM132A 34.5" x 17.875" x 14.625"
RB232B 32 gal Fits SM132B 26.25" x 17.75" x 18.5"
RB244 44 gal Fits SM144 25.75" x 25.75" x 17"